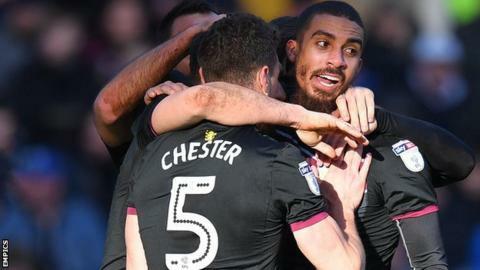 Promotion-chasing Aston Villa twice came from behind to secure three valuable points at Sheffield Wednesday. The hosts took an early lead when Sean Clare finished smartly from Atdhe Nuhiu's lay-off, but Lewis Grabban levelled from close range. Lucas Joao headed the Owls back in front before the break but Glenn Whelan equalised again. Conor Hourihane made it 3-2 to Villa with a powerful shot and Robert Snodgrass added an injury-time penalty. Snodgrass converted after he had been fouled in the area by Frederico Venancio and the victory moved Steve Bruce's side back to within one point of second-placed Cardiff, though the Bluebirds could stretch their advantage again when they face Bristol City on Sunday. The injury-hit hosts nearly went ahead for a third time with the scores at 2-2, but defender Venancio's effort hit the post before being scrambled off the line and Sam Johnstone made a fine save from Nuhiu. Villa, who had earned just one point from their two previous games, took the lead for the first time in the 87th minute when Hourihane drove in his ninth goal of the season before Snodgrass wrapped up the points. Wednesday, who face Premier League strugglers Swansea in an FA Cup fifth-round replay on Tuesday, are now just seven points above the relegation zone. We had a fantastic first half. We made good goals and we had two or three very good chances to come in more comfortable at half-time. "In the second half, we lost that little bit of control we had in the first half and Aston Villa became stronger in this situation. At 2-2, we could have scored two times to make it 3-2. We know we must defend better, we know we didn't have luck on our side today." "To have a group of players who are on the same hymn sheet as the supporters is important. "For too long now, the supporters haven't really associated with the team because of what's happened to the club. "I believe they're enjoying watching the team now, there's association with supporters and the team, which is important." Match ends, Sheffield Wednesday 2, Aston Villa 4. Daniel Pudil (Sheffield Wednesday) is shown the yellow card. Second Half ends, Sheffield Wednesday 2, Aston Villa 4. Goal! Sheffield Wednesday 2, Aston Villa 4. Robert Snodgrass (Aston Villa) converts the penalty with a left footed shot to the top left corner. Penalty Aston Villa. Robert Snodgrass draws a foul in the penalty area. Penalty conceded by Daniel Pudil (Sheffield Wednesday) after a foul in the penalty area. Foul by Morgan Fox (Sheffield Wednesday). Robert Snodgrass (Aston Villa) wins a free kick in the defensive half. Goal! Sheffield Wednesday 2, Aston Villa 3. Conor Hourihane (Aston Villa) left footed shot from the centre of the box to the bottom left corner following a corner. Corner, Aston Villa. Conceded by Joe Wildsmith. Attempt saved. Conor Hourihane (Aston Villa) header from very close range is saved in the centre of the goal. Assisted by Robert Snodgrass with a cross. Attempt missed. Mile Jedinak (Aston Villa) header from the centre of the box is just a bit too high. Assisted by Robert Snodgrass with a cross following a set piece situation. Substitution, Aston Villa. Mile Jedinak replaces Scott Hogan. George Boyd (Sheffield Wednesday) is shown the yellow card for a bad foul. Foul by George Boyd (Sheffield Wednesday). Attempt blocked. George Boyd (Sheffield Wednesday) left footed shot from the left side of the box is blocked. Assisted by Atdhe Nuhiu. Attempt blocked. Robert Snodgrass (Aston Villa) right footed shot from the left side of the box is blocked. Corner, Aston Villa. Conceded by Morgan Fox. Attempt saved. Atdhe Nuhiu (Sheffield Wednesday) right footed shot from the right side of the box is saved in the centre of the goal. Assisted by Jack Hunt. Attempt saved. Lucas João (Sheffield Wednesday) right footed shot from the centre of the box is saved in the centre of the goal. Frederico Venâncio (Sheffield Wednesday) hits the left post with a header from very close range. Assisted by Sean Clare with a cross following a corner. Corner, Sheffield Wednesday. Conceded by Keinan Davis. Attempt blocked. Lucas João (Sheffield Wednesday) header from the centre of the box is blocked. Assisted by Adam Reach with a cross. Corner, Sheffield Wednesday. Conceded by James Chester. Attempt saved. Joey Pelupessy (Sheffield Wednesday) right footed shot from outside the box is saved in the centre of the goal. Assisted by Atdhe Nuhiu. Goal! Sheffield Wednesday 2, Aston Villa 2. Glenn Whelan (Aston Villa) header from very close range to the bottom left corner. Assisted by Robert Snodgrass with a cross. Attempt missed. Joey Pelupessy (Sheffield Wednesday) right footed shot from outside the box is too high following a set piece situation. Adam Reach (Sheffield Wednesday) wins a free kick on the right wing. Foul by Lewis Grabban (Aston Villa). Substitution, Aston Villa. Keinan Davis replaces Josh Onomah. Offside, Aston Villa. Glenn Whelan tries a through ball, but Scott Hogan is caught offside. Foul by Jack Hunt (Sheffield Wednesday). Conor Hourihane (Aston Villa) wins a free kick on the left wing.